Basically Mini Militia is a multi player army shooting game. One can combat with up to 6 players via online gaming and up to 12 players with the local Wi-Fi hotspot. You can with shoot with various guns during the battle. 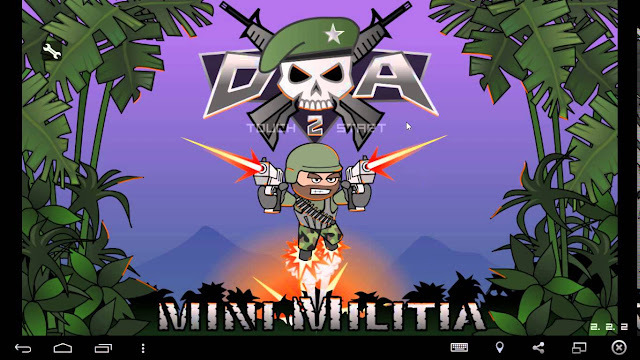 If you are a shooting game addict then Mini militia is the best solution for you. 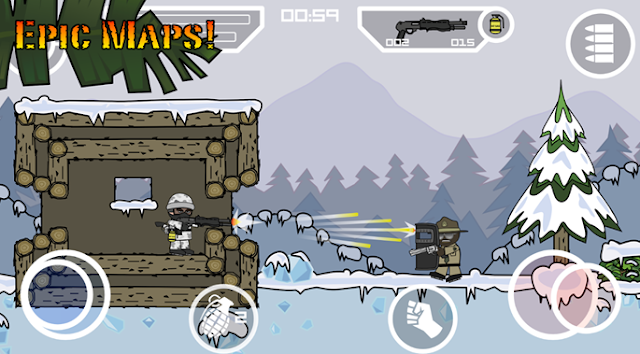 Mini Militia game has become popular in the past few months among the teens. To be specific it's quite popular among the college students. Lets me give a virtual view how does the game looks and feels like. The Mini Militia could be compared to the Counter strike which is a PC game where as this game is more or less close to 3rd person view of CS (Counter Strike) in a Smartphone or Tablets. It's a 2D game which has a great impact of 3D while playing the game. Lets gets into the micro details of this game and after we had gone through all the details, then we will decide about the rating. 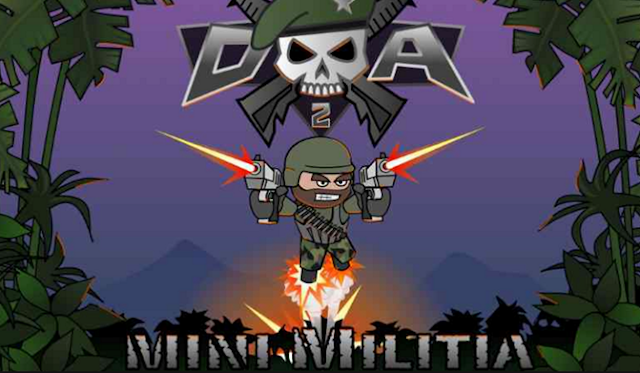 Mini Militia game has been developed by Appsomniacs LLC. They are also the developers of Doodle Army Boot Camp and Doodle Army. This game requires android version of above 3.0 for safe running. LOCATION - For connecting you to the nearest server while playing online. WIFI ACCESS - To connect with other mobile hotspots. 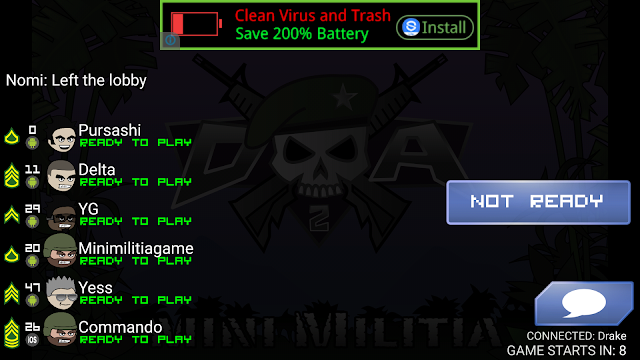 With 1 Million+ downloads and 149278 reviews, Mini Militia game is rated 4.4 out of 5, which is really a great score. Doodle Army 2 also comes with a pro version which could be made as an in-app purchase which comes with a lot of cool feature and add-on. In this part, lets discuss about the game play and menus. When the user opens the app, the app loads and prompts the user to ‘Touch 2 Start’ after which the user does that they will be prompted with a page filled with around 8 options menu. The options displayed in the menu are Upgrade, Quick Play, Multiplayer, Solo Play, Settings, Info, News and Help. This game has got three different game play which are listed as follows. When you click on Solo Play you will two different options which are "TRAINING" and "SURVIVAL". Before getting along the ‘Quick Play’ or ‘Multiplayer’, the user could get trained with the controls under the ‘Training’. TRAINING: Under Training a coach named Sarge will help you out to get start with the Mini Militia game. You will be guided will all the basic controls under this training session. You will also be provided with the training of the weapons. SURVIVAL: Once you are done with the training session, you can now get start with the battle. You can combat with the enemies available in the survival game. You will be helped by Sarge (trainer) while practicing the fight. Once you get yourself well prepared then you can start combating with the real enemies in the quick play and multiplayer modes. The game starts as the avatar is been dropped in air so that it lands on the combat area with a primary and secondary weapon along with few grenades. The game play is for about 6 minutes and 30 seconds. Within this time frame you should be able to kill as many opponents as possible. The controls are simple as could be controlled with ease. The weapons can be toggled by clicking on it as it could be seen on the upper right side corner of the screen and reloaded by clicking on the ammo symbol beside it. Whereas the upper right corner of the screen shows the zooming capacity of the particular weapon which has long range for snipers and shorter ranger for pistol, next to this is the life meter and the jet pack meter. The bar at the upper middle shows the remaining health (pink color) and flying capacity (blue color). In the lower side of the screen from the left, is the circular button which allows to control the movement of the avatar. Then is the grenade icon followed by the fist icon to encounter the close ones and to the extreme bottom right side is the another circular button which allows the user to aim and fire. Here is the trip which this aim and shoot button has, circling the inner inside the outer circle will let the user to aim and moving the inner circle out of the outer circle allows the user to shoot, this is how the aim and shoot button works. Before you start with Quick Play make sure you are connected to an active Internet Connection. Once you select quick play you will be taken to a page where you will be connected to the servers where other people are connected. Everyone conntected to the play, have to choose ready to start to start the game. You may also choose the MAP of your interest and form a team with the other co players available online. Once everything is set the countdown will start and your battle will begin!!! You must be able to kill as many opponents as possible to get good score. Once the time ends up you can find the overall summary and score of every player. Mini Militia game also has got the facility of multiplayer with your friends via the LAN wifi. To do so follow the below steps. 1. Create a Wifi Hotspot in your device and ask your friends to connect to it. 2. Now open the Mini militia app and then choose Multi player. 3. Now select LAN WIFI and then choose Death Match. 4. You need to host by selecting the host option. 5. Then choose the preferred MAP / location for the game play. 6. Finally wait for your friends to join the game. 7. You may form teams with your mates or just play solo. 8. Once everyone is ready the game will begin. 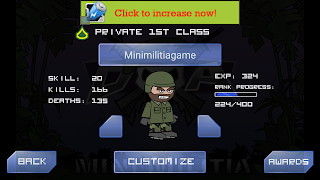 If you are a newbie and if you want to rank well in mini militia game then follow the tips and tricks given below so that you can easily become a pro in mini militia. Don't straight away combat with the pro players who has already got very high score. Try to reload the guns and keep it fully loaded before you battle with new one. Try to keep the blue bar full whenever possible, so that you can escape during attacks easily. Don't get yourself stuck in the middle where two others are already on attack. If your health is less commit suicide so that your opponent will not get the points. If a bomb is thrown towards you then sit down so that it will have less effect on your health. Place thegreen grenades in the respawning area so that opponent will get killed automatically when he respawn. Try to get the shotguns, snipers and rocket launchers. Make use of the double guns wisely. The various guns available in Mini Militia are Desert eagle, Uzi, magnum, MP5, AK47, M4, M14, shotgun, M93BA, SMAW, machete, PHASR, flamethrower, and various grenades (frag, proximity, gas). Even powerups like power boost, riot shield and health pack are available. 1. Go to the game settings. 3. Now you will see the customizing page as you find in the image. 4. You can now rename your avatar with a custom name. 5. To get the characters choose Customize button available below. 6. You will end up with the editing page where you may set up the avatar of your interest. 7. Once done click on save. The latest version of Mini Militia which is available for download at the time of writing this article is v2.2.23 which was updated on April 17,2016. This version has improved a lot from its previous versions in fixing the bug and finding player quickly who are online under the ‘Quick Play’ game mode. The user could even pick up the weapons after killing the opponent. But, only few weapons could be picked by the free users where as the pro users could pick and use all the weapons which are available online. The pro version could be purchased under the menu ‘Upgrade’ for less than $1. As from the kills made and score along with experience, the character gets to be ranked. As per your ranks the mini militia badges also given eventually increases. 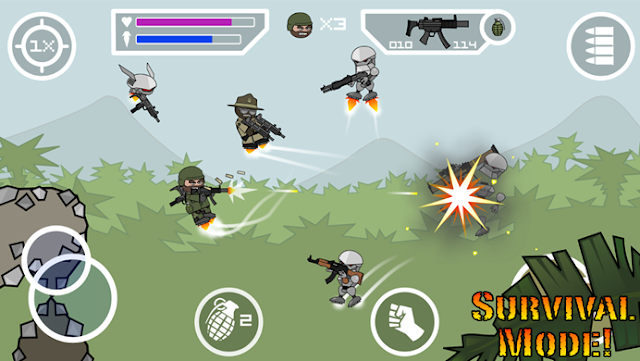 This game, Doodle Army 2: Mini Militia gives one of the greatest experience in the Mobile platform which makes us so much obsessed. Download the game and enjoy the ultimate gaming experience. Comment your experience about this mini militia game and also do share the post with your friends!!! I want to hear the music of game during play. how? that rank table seems wrong. 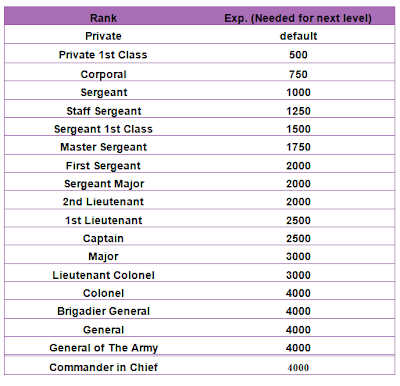 you need 100 exp for first rank upgrade and 400 for next.